Construction costs for the World Trade Center memorial have risen to an estimated $1 billion, twice as much as officials had planned to spend. Last year, officials said the memorial, slated to open in 2009, would cost $490 million to build. Contractors this week issued a revised estimate of $1 billion, a person familiar with the figures told The Associated Press on condition of anonymity because the number had not yet been publicly announced. The new estimate includes $700 million for memorial and museum construction and $300 million to prepare the site, such as work shoring up a retaining wall and other infrastructure costs, the source said. The New York Times notes that a report by Bovis Lend Lease, the construction manager hired by the World Trade Center Memorial Foundation to analyze projected costs, includes expenses like $25 million in insurance and $22 million for museum exhibit design and construction, as well as a $22 million increase in the cost of the entry pavilion to the underground museum. Steve Coleman, a spokesman for the Port Authority of New York and New Jersey, which owns the trade center site, said the agency hadn't seen the latest construction estimates and couldn't comment. Mayor Michael Bloomberg said the costs of building the Sept. 11 memorial are skyrocketing and must be capped at $500 million. "There's just not an unlimited amount of money that we can spend on a memorial," Bloomberg said. Any figure higher than $500 million to build the memorial to the Sept. 11, 2001, terrorist attacks would be "inappropriate," even if the design has to be changed, he said. A spokeswoman for Gov. George Pataki said the governor also supports a firm budget for the memorial. The memorial would by far be the most expensive ever built in America. The World War II memorial in Washington cost $182 million to build. Construction costs for Maya Lin's Vietnam War Memorial wall, also in the nation's capital, were $4.2 million. The nonprofit World Trade Center Memorial Foundation has raised $130 million privately in about a year. The Lower Manhattan Development Corp., the agency overseeing the memorial design, has committed $200 million. The Port Authority has committed $100 million. The foundation has not addressed how it will handle the annual expense of running the memorial and the museum, which could reach nearly $60 million, according to The New York Times. 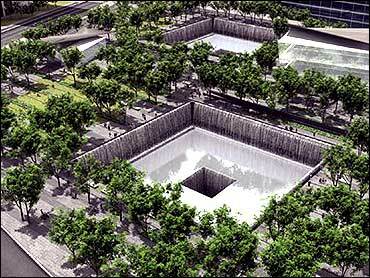 Designed by Michael Arad and Peter Walker, the memorial includes two huge reflecting pools, inspired by the fallen twin towers, surrounded by a forest of oak trees. The names of the nearly 3,000 dead will surround the pools underground. An underground museum dedicated to Sept. 11 will be built around the memorial. Gretchen Dykstra, president of the memorial foundation, wouldn't say whether budget constraints would change the current design. "The foundation is delighted that conversations are happening among political authorities and looks forward to further clarification of the statements made today," she said. Development Corp. spokesman John Gallagher said the agency is trying to build a "fitting and appropriate memorial that honors the memory of the victims of the 9/11 attacks." "We will continue to look at appropriate strategies to accomplish that goal while being mindful that the budget must remain at $500 million," he added.